When travelling along the Beaulieu Road, south-east of Lyndhurst, notice the substantial earthen bank intersected by the tarmac, just where the ground rises beyond the last house (A). It’s probably not a subject that exercises many peoples’ minds, yet this humble earthwork is at least 700 years old. It is part of what is known as the Park Pale, an earthen bank with internal ditch that once enclosed what became known as Lyndhurst Old Park, a medieval deer park dating back to at least the 13th century – presence was first recorded in 1291, but even then, it was not new. Despite many years of wear and tear, the bank and ditch in places are still an enormous 9 metres (29 feet) wide, whilst the bank is up to 1.2 metres (4 feet) high. Add the height of the paling fence that would inevitably have been present, and the whole would have been far too large for even the most energetic deer to leap, providing an extremely effective method of containing the deer within the confines of the park. (Deer parks were almost certainly created to provide a readily accessible source of winter meat in the days long before refrigerators became available. In 1086, at the time of the Domesday survey, the existence of thirty-five such parks was recorded in parts of the country covered by the survey, and this number subsequently greatly increased. Deer were encouraged to enter many of the parks over or through 'deer leaps', gaps in the fence or sections of fence of reduced height with adjacent steep ground on the park side, designed to prevent escape. 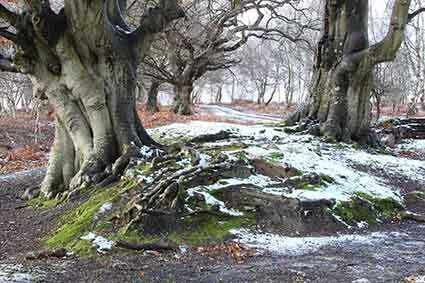 An example of this type of feature is recalled by the names of Deerleap Inclosure and Deerleap Farm, both located close to the old New Forest boundary a little to the south-east of Ashurst). The Park Pale is not specifically shown on the late-18th century Richardson, King and Driver map, although its course can be traced in the line of the Lyndhurst parish boundary which here coincides with the boundary of a New Forest Keeper’s Walk. Shown as a line of dashes, its semi-circular shape encloses Park hill Lawn, Botley Field and South Lawn; and skirts the southern and eastern edges of the accompanying map. It is, though, clearly marked on modern Ordnance Survey maps, and encloses a flask-shaped area, with one broad, open end running alongside Park Ground Inclosure, and a narrow neck situated between the Beaulieu Road and, to the north, The Ridge. Deer, it has been suggested, were driven in at the open end, and herded into the narrow neck to be summarily shot with bows and arrows, although recent research suggests that the original park was not flask-shaped at all, and was, in fact, considerably larger than the area now enclosed. Today, three species of deer enjoy the freedom of the old park, all relatively unhindered. Fallow deer are most likely to be seen, but roe deer occur in reasonable numbers and, very occasionally, red deer, too. Slots and droppings reveal their presence, even if the animals themselves are not glimpsed.